Maybe it is the expectation on blockchain technologies. Or it would be the possibilities the technologies may have. There are series of companies and projects making announcements to start their own blockchain businesses in various fields. The advertising industry is one of the fields having the most fierce competitions. Currently there are several advertising projects listed on exchanges in the global market. In Korea, the weBloc project is undergoing its ICO at the moment. The reason why competitions are extremely fierce in the advertising market would be the complicated market structure, not disclosed to the public in general. The structure of the advertising market consists of multiple layers and each step has separate middlemen. In addition, each layer is run by bidding systems and more than 90% of advertising fees would be taken away under the name of commissions. In other words, there would be a huge room for innovation in the advertising market and it would be easy to implement blockchain technologies. There are so many projects planning to innovate the advertising market while none of them has made a remarkable or significant success in the market. Look how complicated the digital advertising ecosystem is..
At the same time, generating a working service having a real-world usage would be the biggest issue for the blockchain projects today. So many projects have raise huge amounts of money — tens of million U.S. dollars — with their Whitepapers only, but none of them — maybe expect Steemit — has failed to come up with a service working and being managed for actual users. The weBloc project also started with the same circumstances in the market. Rather than “getting rid of all middlemen” or “blocking all advertisements”, it aims to decentralize the market while creating an alliance for all the middlemen and other players in the advertising makret. By doing so, it has set the inital goal to raise the efficiency of the market and measure the actual performance of advertisements. To achieve this goal, weBloc has been making partnerships with countless previous partners and clients — which would not be revealed due to NDAs — establishing the Advertising Alliance. On top of the marketing platform created by the legacy corporation AD4th Insight, more and more other blockchain-based projects are making partnership with weBloc. 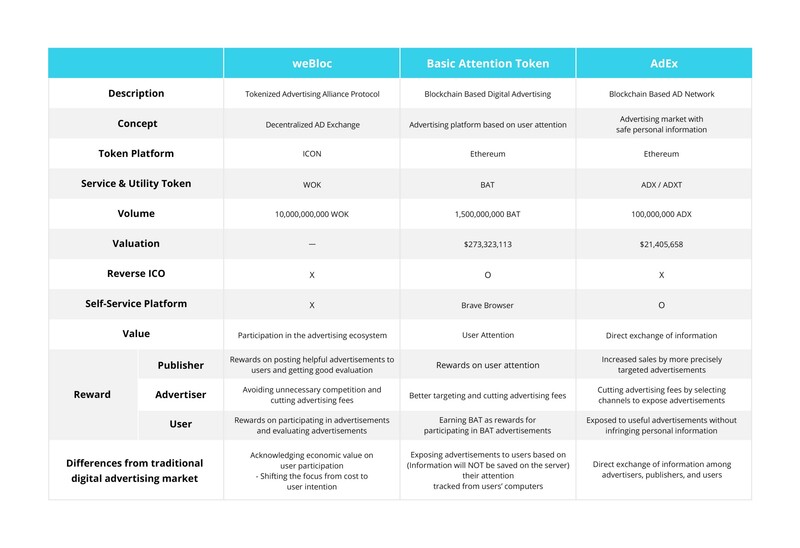 Let’s take a look on the cases of blockchain projects related to the advertising market — Let’s make a comparison. First of all, BAT, or Basic Attention Token, would be one of the most familiar ones. It has finalized its ICO successfully and launched the Brave Browser as its service. 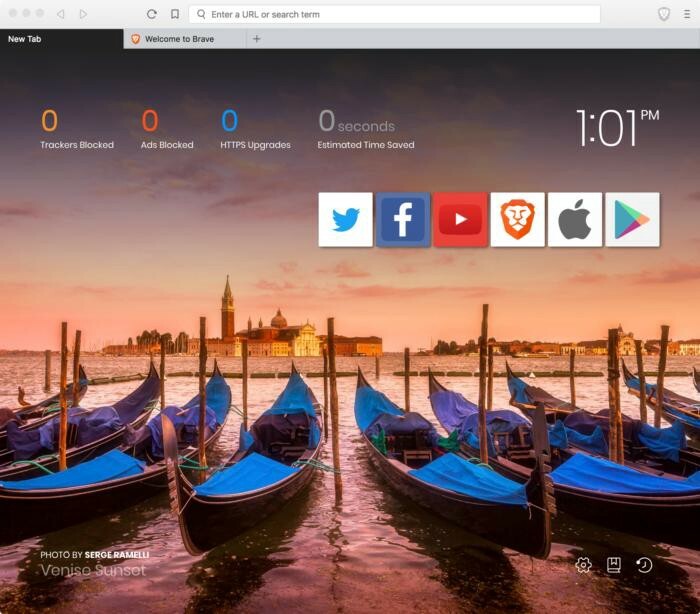 Brave Browser blocks all advertisements and tracking programs and the users will be exposed to the advertisements they allow. On the Internet, no matter which browser users choose, all the activities of users are being tracked according to search results and users have been exposed to advertisements based on this. Brave Browser blocks all of this and exposes only the advertisements allowed by users. This would be an effective way to some users who found advertisements annoying, but the question remains wondering how many people would be willing to change their main browsers to block advertisements. In addition, if all the middlemen lost their places and all advertisements were blocked at a extreme level, the entire commerce ecosystem may collapse where the majority of consumption is led by advertisements. This approach will make all the middlemen or the advertising industry as an enemy. It would be difficult to avoid the fact that blocking advertisements would have a certain level of utility in it. But BAT project is based on a premise that all advertisements are unnecessary or inappropriate. Unfortunately, appropriate advertisements also has the function of delivering information, leading to a conclusion that blocking all advertisements would be popular or become mainstream. In fact, the statistics about the browser market share rates in July 2018 showed that Brave Browser even failed to be recognized. The AdEx project would be another case of blockchain projects targeting the advertising market. The AdEx project connects advertisers, publishers, and users directly, getting rid of middlemen and commission fees. The structure is pretty similar to the conventional network advertising. It also emphasizes and clearly defines the role of publishers rather than killing all the middlemen, but the project has not described the details on how the project will remove commission fees and how its smart contract is designed. Both BAT and AdEx have chosen Ethereum as their platform — making differences from the weBloc project that chose ICON as the platform. Considering the fact that there ARE so many transactions happening on every step in the advertising market and each click on advertisements would be considered a contract, those projects WILL face the problem of Gas fees — which would be the toll for using the Ethereum platform — and slow speed of making smart contracts. 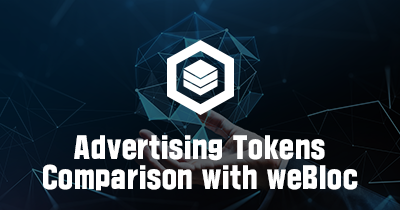 On the contrary, weBloc provides an advertising protocol on top of the ICON using the extremely high TPS to deal with countless number of contracts. 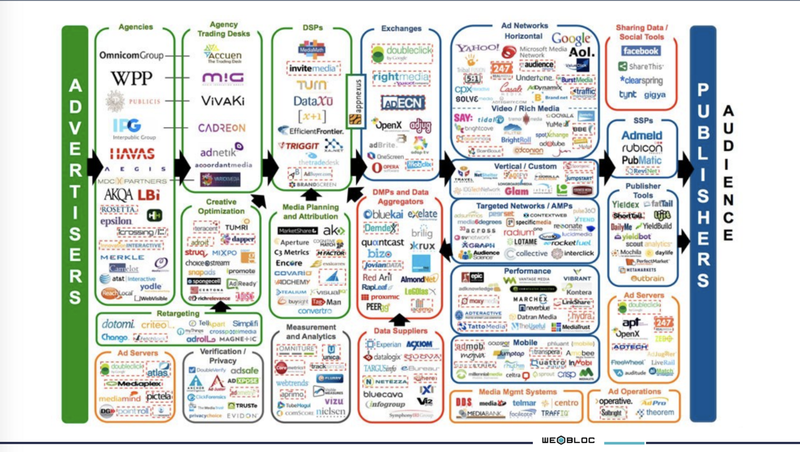 The advertising ecosystem is tied with so many complicated issues having stakes. Therefore, it does not sound convincing to so many players in the advertising market if a project claims that “blockchain technologies will get rid of all the middlemen and automatically improve transparency and efficiency!” The joint efforts of all the players in the market to change the entire market would be the must. A project would be able to actually innovate the advertising market and develop a new ecosystem only when it can come up with a structure where all the players including advertisers, middlemen, and users can enjoy the benefit. 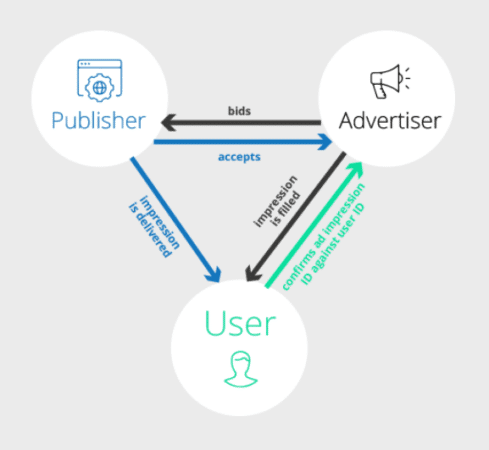 weBloc suggests a Tokenized Advertising Alliance Protocol where all players in the advertising ecosystem can benefit from each other.